The Kenda Kinetics front / rear specific tires are a smart all-round option if you're not too picky about your tires but know that you want them to get you there and last a long time. Chunky rectangular lugs hook up well in loose conditions, but they're hard enough to roll fast on harder terrain as well. The performance of the long-wearing compound is maximized by front and rear specific designs so you can get the most out of this value tire. Folding bead. 60 TPI casing. 26" x 2.35". 40 - 65 PSI recommended inflation. Claimed weight is 705 g +/- 35 g.
I Put These Tires On My Town & Country Cruiser. Looks Great. Rides Sturdy. Very Durable. I Like The Sound Of The Knobs On Pavement. On Road And Off, I Am A Very Satisfied And Happy Customer. Aloha From Hawaii, hawaiianbrian. I can't believe Kenda still makes these. I used to run them on my Santa Cruz Bullit and the bike actually looked like a motocross bike less the motor. They grip very well on hard pack as well as loomy conditions. On asphalt they are super slow like Kenda's Nevegals (never rolls) The price is great and protection is so so, as they dont do well with thorns. They do give you the confidence to shred singletrack and corner quickly with zero problems. 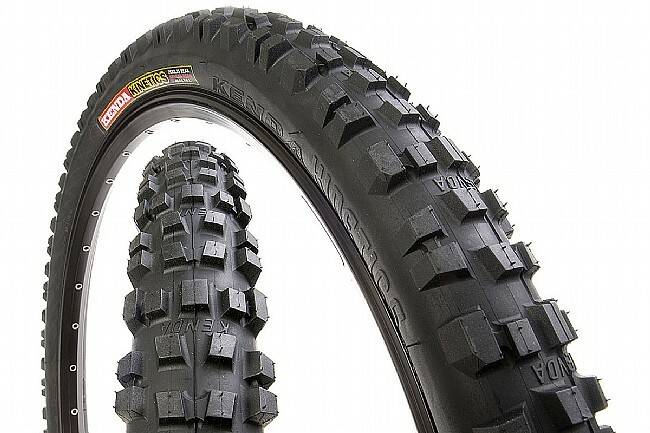 Try these tires on your mountain bike on the snow before buying a fat tire bike. I live in the Methow Valley, Washington which is a mountain biking/cross country skiing destination with 200 kilometers of groomed ski trails, some of which have been opened for fat tire bikes, with tire presure less than 10 psi(or so). Obviosly, these bikes are heavy and slow and don't go up hill very well. Although I suspect that any non-studded tires will not work on hard ice, I have been very happy with my x-cty setup(40 psi) on most winter road conditions, including snow cover on frozen lakes, and this setup is way faster than a fat tire bike. My setup is less stable and does not work in deep snow where the fat tires have more float...but how often are you in deep snow unless you're doing the bike Ididerod? Works fine for CA trails. No complaints. The only tire I will ever use as long as I can find them. Hooks up on climbs, carves thru turns and low resistance even at low pressure. Never had a flat. Can't beat them. I used these at Castro valley mountain trails around December. The trails were dry and some corners had loose rocks. These tires served their purpose because I survived my first time mountain biking thru steep, leafy, and road trails. The tires were knobby enough to grip dirt trails and rolled easy enough on road that didn't throw me off balance. 8 of 14 customers found this review helpful. 30 of 31 customers found this review helpful. For a $25.00 tire it is great,rolls well,stops well on hard pack,good in loam.The tire is sized at 2.35 but it is more like a 2.2.Best quality is how it works with the rear suspension.Some high volume tires tend to bounce when going thru rocks,the Kenetics lets the suspension work.